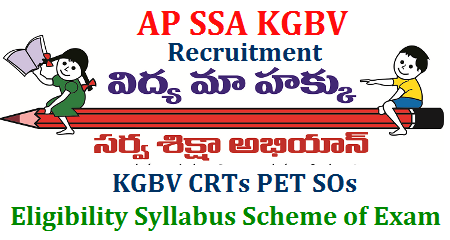 AP School Education Department Sarva Shiksha Abhiyan SSA has decided to Fill up the vacancies in KGBV Schools all over Andhra Pradesh by written Exam. SSA is going to issue Detailed Notification Recruit KGBV CRTs SOs PET Posts. In that Notification they mention Eligibility criteria Exam Syllabus Scheme of Examination Selection procedure.